It's 'Hump Day'! we find ourselves smack dab in the middle of the week, in the middle of the month, and nearly in the middle of the year! It may be time to evaluate things. How's it going for you? What have you accomplished so far? It has been a good year for me so far, full of lots of learning and growing, but honestly, currently in this BUSY month of June, time seems to be going SO SLOWLY! I can hardly remember anything prior to this month! Let me tell you about all that I've been up too. At the Ballet Magnificat dance studios we are now full-force preparing for both our summer dance camp, and already rehearsing for the Christmas season as well! It is so exciting that our summer dance camp is on the horizon! It is a 4 week program (or 2 two week programs) held during the whole month of July. Our summer dance intensive (SDI) gives us company members the delightful opportunity of working first-hand, teaching dance classes and bible studies, mentoring, and worshiping with a myriad of young eager Christian ballet students that will be joining us from all around the world. Prior to the month of July we each have the responsibility of lesson planning! 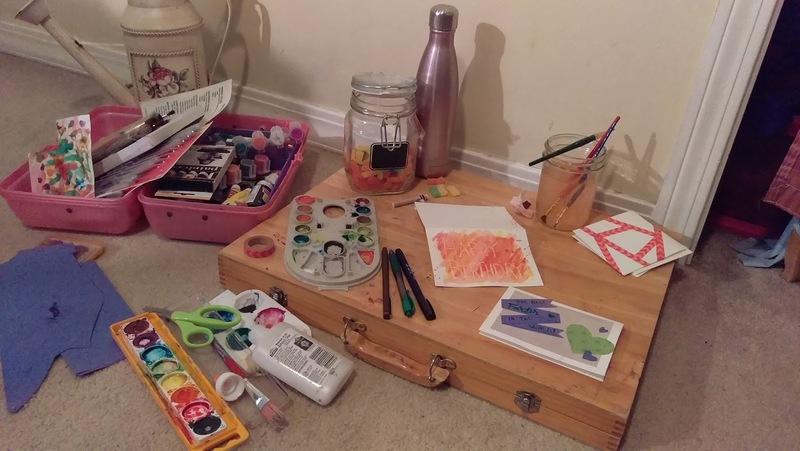 So basically, when I am not busy dancing around, rehearsing, working my part-time job, or blogging ^_^ I am lesson planning; whether it is ballet class lesson plans, or bible study lesson plans. Lesson planning occupies much of my time these days. Tons of special occasions have been/or are to be celebrated this month; We just had a wonderful 30 year company reunion this past weekend in which I got to see several of my old friends, Fathers Day is coming up this weekend, and there are several summer birthdays approaching! In the little spare time that I have, I am trying to make it a priority to set aside time for crafting/card making! I am want to make it a priority because 1) I love blessing people with my little happy's and/or written words of encouragement and 2) It's something I enjoy doing and I think that is reason enough! Check out some of my creations that are available for purchase in my SHOP. 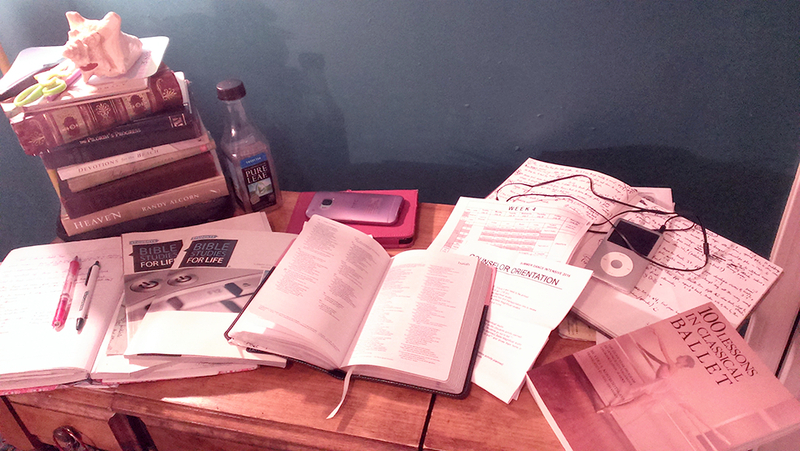 I have no room on my desk these days for crafting because it is full of materials for lesson planning. I resort to finding a comfy spot on the floor! 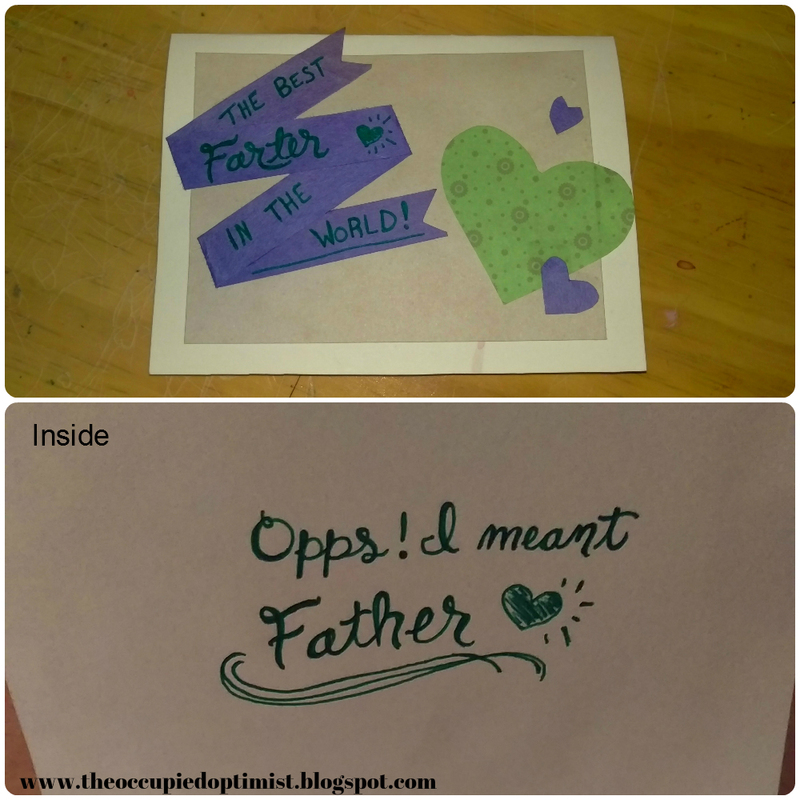 A funny Father's Day card I made for my daddy! This Card was very easy to make. On the front of the card I used fun colorful paper cut into bold shapes, and who knew that folding a strip of paper once or twice could make for a cool looking banner. Inside I got to practice my calligraphy using my favorite pine green Pilot G2 Pen . I've learned a new technique that I am so excited to share with you, using water color and a white crayon. First what you do is draw or write something with your white crayon on your watercolor paper. It will be a little tricky considering you will be drawing white on white and may not be able to clearly see what you are doing, but it doesn't have to be perfect. Any occurring 'imperfections' will contribute to the uniqueness and the creative look of your project. Next, using your watercolors, all you need to do is paint over your crayoned writing/drawing. Paint whatever you want, using whatever colors you want! The white crayon will repel the paint and your crayoned creation will be made visible, like magic! The paint will simply surround and frame whatever you drew with the crayon and it will create an awesome effect! 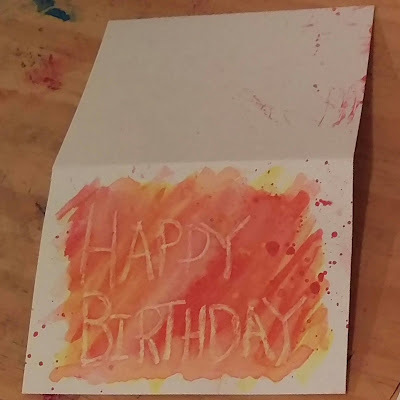 Below is a birthday card I created using this technique. A great project for kids, but try this fun easy project for yourself! 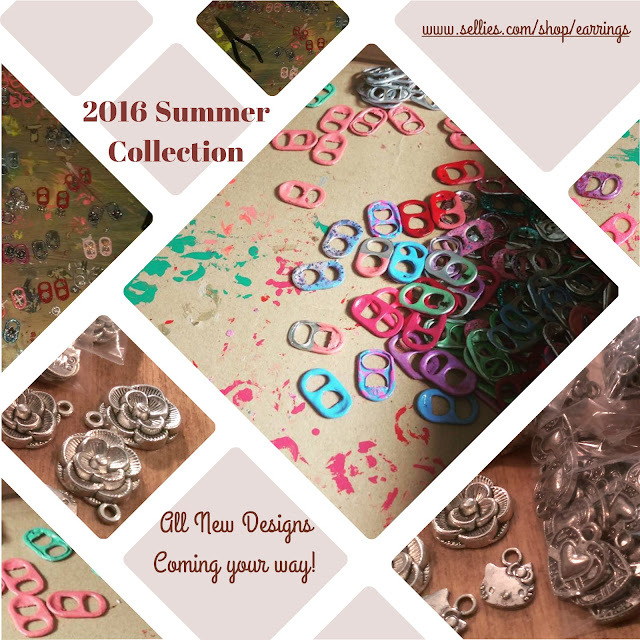 I have been working diligently on a new collection of upcycled soda tab earrings, to be premiered this summer featuring new colors, new charms, and new adornments! They are going to be awesome! Keep your eyes peeled for their arrival in my online SHOP. Also, Today marks the halfway point for my Alumni of the Year Campaign! It is a fundraiser campaign to raise money for my old ballet schools scholarship program. Thank you SO much, to those of you that have contributed and shown your support! Between you and I, and my fellow alumni nominees we have raised over $8,100! Together we have achieved the funds needed to provide full academic year scholarships for TWO pre-professional students – and we are so close to a third. It is not to late to contribute to the Changing Lives Scholarship Fund if you are still interested! I have only been able to raise 41% of my goal but that is optimistically okay. We have something to strive for, and have until July 22. If you would like to partner with me in showing support for ballet, and solid education in the arts by making a contribution to the CPYB Changing Lives Scholarship Fund, visit my campaign page HERE. In other news, as you may or may not be aware of, I have been investing quite a bit of time and energy into this blog! Not only with producing substantial consistent content and creating fun updates, but also I have been doing much research and gaining understanding in hopes of taking steps closer to monetizing it. I am very excited by the thought of doing so, and feel I should take this time to thank YOU! With my blog only being half a year old, it is because of supporters and faithful readers like you that taking those steps forward so soon are even possible, so thanks for sticking with me! The best is yet to come for 'The Occupied Optimist'. Please continue to interact with me by submitting your comments or by contacting me via email. My contact information can be found in the 'about me' tab located in the menu bar at the top of this page! I would love to receive your comments ideas and/or suggestions as to what I can do to make your 'reading experience' better here at The Occupied Optimist! I want to know what you would like me to write about or if there are any questions you have about ballet, crafting, the bible, or anything! For me, your involvement is what makes maintaining this blog so fun! Be sure to check out The Occupied Optimist's latest enhancement which is a new category under the 'Shop' tab located in the menu bar at the top of the page. I've set up an 'Amazon Astore' that features the hot trending items and recommended merchandise that I sometimes talk about here on my blog. I am really excited about this. Check it out HERE! Let me know if there is anything you would be interested in seeing in the 'Astore' and I will see what I can do! As far as my Summer Reading has been going; Unfortunately it has kind of been put on a stand still with how busy I have been. Oh Well. Perhaps I will get through my list of 'books-to-read' by the end of August. In a nut shell, that is everything occupying my heart and mind these days! God is in it all as well, of course. Maybe there is room for Him to be even more involved in all these things, and in my life, than what I am currently allow Him, hmm ...am I to busy for my own good? That is a topic for another day. Anyway, Thanks for reading! comment, follow, subscribe and don't be shy!